Currently is howling outside and snowing, and at this point in the winter, a total nightmare in my mind. It makes me glad that I can sit and dream about Spring while I wait for it to show up hopefully by the end of March. 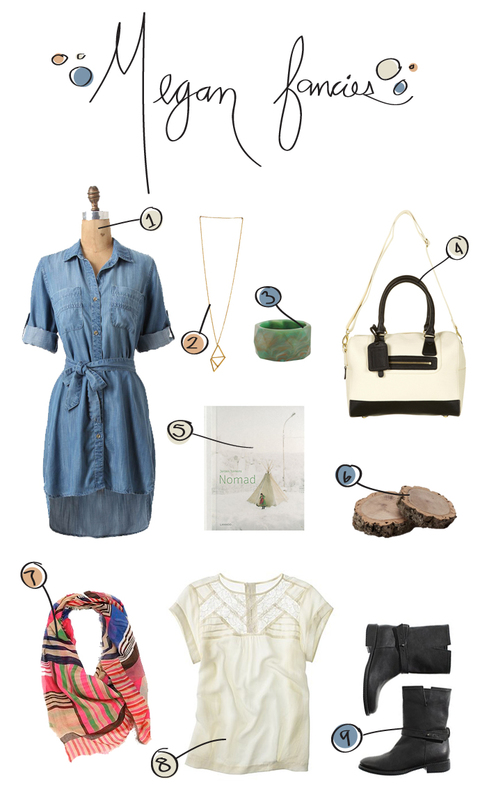 This Spring I am thinking about shirt dresses, scarves, and low ankle boots. Spring in Northern Michigan means you can actually wear shoes that are not snow boots, which means no sandles just yet so these ankle boots from Madewell are perfect for strolling the streets and running errands on cool-in-the-shade kind of days. Pairing the shirt dress with a chunky belted sweater and tights will make for a perfect Spring outfit here till it gets above 55. Can you tell I am ready for Spring?! Such lovely picks here, Megan!